2K Announces Sid Meier’s Civilization® VI Launching October 21, 2016 | Take-Two Interactive Software, Inc.
NEW YORK--(BUSINESS WIRE)--May 11, 2016-- 2K and Firaxis Games are excited to celebrate the 25th anniversary of the Civilization series by announcing that Sid Meier’s Civilization® VI, the next entry in the award-winning turn-based strategy franchise, is currently in development for PC. Sid Meier’s Civilization VI will offer players new ways to interact with their world, expand their empire across the map, advance their culture, and compete against history’s greatest leaders to build a civilization to stand the test of time. Sid Meier’s Civilization® VI is not yet rated by the ESRB, is available for pre-order now on Windows PC, and will be released worldwide on October 21, 2016 for $59.99/£49.99/€59.99. 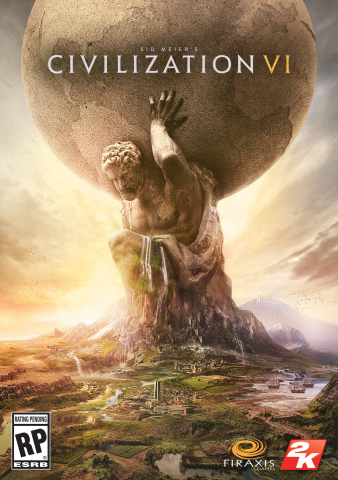 Expand your empire further with the Civilization VI Digital Deluxe Edition, which includes the full base game, the 25th Anniversary Digital Soundtrack, and access to four post-launch DLC packs that will add new maps, scenarios, civilizations and leaders for a bundled discount. Come see Sid Meier’s Civilization® VI at 2K’s E3 booth, # 1601, South Hall. Founded in 2005, 2K develops and publishes interactive entertainment globally for console systems, handheld gaming systems and personal computers, including smartphones and tablets, which are delivered through physical retail, digital download, online platforms and cloud streaming services. 2K publishes titles in today’s most popular gaming genres, including shooters, action, role-playing, strategy, sports, casual, and family entertainment. The 2K label has some of the most talented development studios in the world today, including Firaxis Games, Visual Concepts, Hangar 13, Cat Daddy Games and 2K China. 2K’s stable of high quality titles includes the critically acclaimed BioShock®, Borderlands™, and XCOM® franchises, the beloved Sid Meier’s Civilization series, the innovative Evolve™, the genre-fusing hero-shooter Battleborn®, the popular WWE 2K franchise and NBA 2K, the #1 rated and #1 selling basketball franchise*. 2K is headquartered in Novato, California and is a wholly owned label of Take-Two Interactive Software, Inc. (NASDAQ: TTWO). For more information, please visit www.2k.com. *According to 2008 - 2016 Metacritic.com and The NPD Group estimates of U.S. retail video game sales through March 2016. The statements contained herein which are not historical facts are considered forward-looking statements under federal securities laws and may be identified by words such as "anticipates," "believes," "estimates," "expects," "intends," "plans," "potential," "predicts," "projects," "seeks," "will," or words of similar meaning and include, but are not limited to, statements regarding the outlook for the Company's future business and financial performance. Such forward-looking statements are based on the current beliefs of our management as well as assumptions made by and information currently available to them, which are subject to inherent uncertainties, risks and changes in circumstances that are difficult to predict. Actual outcomes and results may vary materially from these forward-looking statements based on a variety of risks and uncertainties including: our dependence on key management and product development personnel, our dependence on our Grand Theft Auto products and our ability to develop other hit titles, the timely release and significant market acceptance of our games, the ability to maintain acceptable pricing levels on our games, our ability to raise capital if needed and risks associated with international operations. Other important factors and information are contained in the Company's Annual Report on Form 10-K for the fiscal year ended March 31, 2015, including the risks summarized in the section entitled "Risk Factors," the Company’s Quarterly Report on Form 10-Q for the fiscal quarter ended December 31, 2015, and the Company's other periodic filings with the SEC, which can be accessed at www.take2games.com. All forward-looking statements are qualified by these cautionary statements and apply only as of the date they are made. The Company undertakes no obligation to update any forward-looking statement, whether as a result of new information, future events or otherwise.